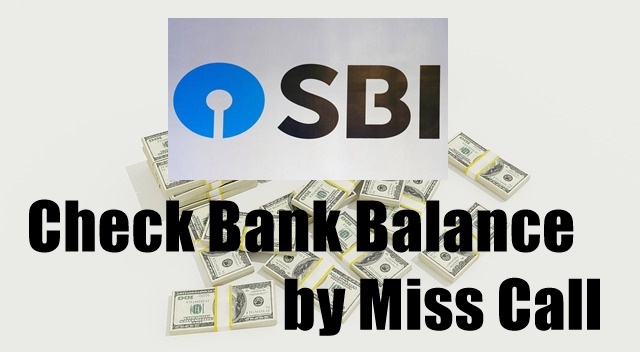 Check Bank Balance by Miss Call: Today time is changing very fast, at the time when we had to know the balance of SBI Bank Account. Then you had to go to the bank but now you can know your bank balance from your mobile phone. If you have a bit of information about the internet, you can control your account through NetBanking from your mobile phone. Today many people are taking advantage of home-based Netbanking facility. Nearly all the major banks of the country have provided Net Banking facility to their users. Talk to the country's largest bank SBI, you also get NetBanking facility. If you want to open Netbanking in your SBI Bank Account. So we have also written a post about this. You can read this post by searching on the site. Today, there are many ways to know balance, such as Miss Call, SMS, Debit Card, Net Banking and USSD Code etc. If you do not have Debit Card and NetBanking but you want to check Balance. So the simplest way is to have Miss Call and SMS. However, for this, you must have a registered mobile number in the bank account. If you have not yet registered a mobile number in your account. You should get this done as soon as possible. There is absolutely no money in registering the numbers. It is completely free. For this, you will need a photocopy of an application, Aadhar card, and passbook or bank ID card. All these documents have to be deposited in your branch. After this, the number will be registered in your account. So once you register the number, you can check Bank Balance from your mobile. Here we are going to tell you how to check balance in the country's largest bank SBI because most people in the country have this bank account. If you have an SBI account, you will not need Debit Card or Netbanking for information on Balance or Mini Statement, because the bank has already introduced the feature of getting account information from SMS and Miss Call. To avail of this service, you must have a registered mobile number in the bank. The special thing is that with the help of this service, information like balance loan and mini statement, education loan interest certificate, home loan interest certificate etc. can also be obtained. However, with the help of SBI Quick, there is no financial transaction facility available. To avail this service, first, you need to send the REG <Space> Account Number message from the register number in your bank and send it to 09223488888. After this, there will be a confirmation message that will be told that you have successfully registered for SBI's Miss Call and SMS service. Now to know the balance from Miss Call, call the registered mobile number at the bank 09223766666. When you call, it will cut automatically after about 3 seconds and within about 5 seconds your account balance will be sent to your mobile. To know the SBI Balance Check by SMS, you need to mail BAL from your registered mobile number and send it to 09223766666. The next message will come in which you will be informed about how much you have in your account. To check the Mini Statement of Mini Statement, now you only need to call this number 09223866666 and your mini statement will be mailed to your mobile within 5 seconds of calling. In this way, you can easily get your SBI Balance Check by sending a message from your mobile. So now you must know that Check Bank Balance by Miss Call, you must have a register number in the bank to take advantage of this service. If your account does not have a mobile number register. So above you have been told also. After registering the number, you have to call or message the above-mentioned number. After a few seconds of making a call or a message, you will get the message of bank balance in the mobile.